In 1990, Bill Watterson created a Calvin and Hobbes storyline in which Calvin is bullied into playing baseball during recess. Watterson drew a relatable, cautionary tale about the dangers of cramming boys into neat little boxes. Everyone in this story wants Calvin to do something he hates, but even when he commits to it, nobody helps him succeed. This piece previously appeared 11/3/17. The storyline opens with Calvin playing alone on the swings at recess. As he swings higher and higher, the panels lose their upright rigidity and swing along with him. This is Calvin at his happiest—doing whatever he wants. Calvin soon discovers that the swings are empty because the rest of the boys signed up to play baseball at recess. Susie, Calvin’s arch-nemesis and crush, asks Calvin if he wants to ride the teeter-totter with her since he isn’t playing baseball, and Calvin’s first reaction is defensiveness. One strip later, Calvin has backed off his “girls have cooties” stance. He’s teeter-tottering and venting to Susie about his dislike of team sports. Susie is the only person in this storyline who takes the time to ask why Calvin doesn’t want to play baseball, and she listens to his responses rather than making it about herself. Calvin hates the rules and restrictions of organized sports, but his explanation also suggests a lack of knowledge. He complains that, in sports, “Somebody’s always yelling at you, telling you what to do, where to be, and when to do it.” It implies a certain inexperience—people have to tell him what to do in organized sports because he doesn’t naturally know how to play them. Whether through lack of knowledge or a dislike of structure, Calvin doesn’t gravitate toward baseball as naturally as the other boys seem to. Even Moe, as stupid and unaware as he is, notices this, and he shames Calvin for being a “sissy.” As with every other incident in Calvin and Hobbes concerning Moe, debating or reasoning with him is a zero sum game. Calvin finds himself signing up for baseball in spite of himself. As a kid—and still as an adult, if we’re being honest—I could never swing a bat or throw a ball. My father could have taught me—he grew up in Fort Greene, Brooklyn, and played stickball as a kid—but he never did. Playing catch with him was miserable. He’d laugh at me for throwing “like a girl,” while giving me no memorable pointers on how to do anything differently. He only threw and caught, like he was waiting for my natural ability to surface. Eventually, we stopped playing. I blamed myself for years. I assumed that throwing badly was just a natural defect that separated me from other boys. Later I blamed my father for not fulfilling one of his responsibilities as a male figure in my life. I needed a role model, someone to give me a skill that looked like it came so easily to the other boys. He knew about things I desperately needed—how to throw a ball, how to swing a bat—and giving me that knowledge would have helped me fit in. As more time passed, I realized that my father had false expectations. It’s not that he refused to teach me; it’s that he never realized he had to. The expectations placed on boys and men to be self-sufficient prevents them from giving out help, as well as from seeking it. Like my dad, Calvin’s dad does not refute Moe’s teasing; if anything, he reinforces it (even though neither he nor Calvin seem to know that baseball and softball are two separate things). The most ironic thing about the above strip is that in the final panel, Calvin’s dad shows some awareness of how he’s hurting his son. He laments that as an adult, he can no longer have fun and must compete, but he still places those expectations on Calvin and shows no concern that Calvin only signed up to stop getting teased. Like my dad, Calvin’s father doesn’t offer to teach him. That evening, he suggests they “try some catches” and “practice.” He presumes, incorrectly, that Calvin knows the basics and just needs some confidence. Calvin gets hit in the face by a ball on the first play. 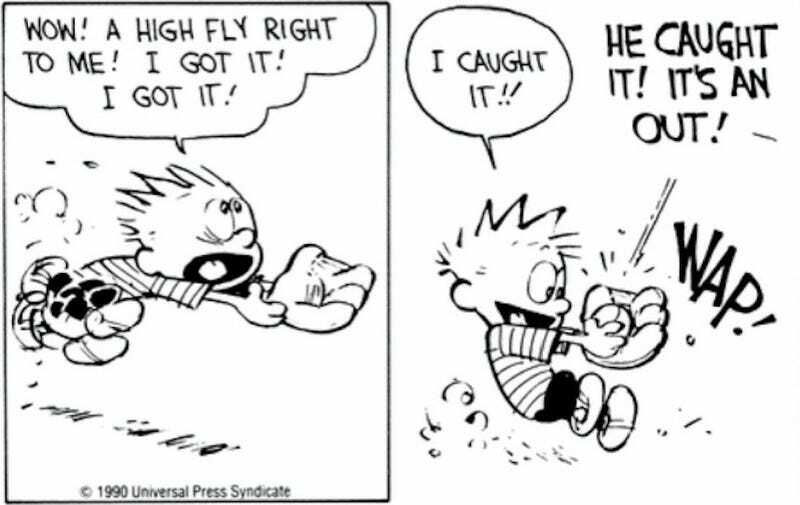 It reminded me of playing catch with my father; instead of encouraging Calvin to try again, Calvin’s father goofs on his son for failing at a skill that he never taught Calvin to begin with. The following morning, against Calvin’s protestations, his parents send him to school with a baseball mitt. When Calvin arrives at the baseball field for recess, Mr. Lockjaw—an educator!—is just as clueless as every other adult. It quickly becomes apparent that Calvin doesn’t know how to play, but instead of teaching him, Mr. Lockjaw just sends Calvin to the furthest corner of left field. Out here, Calvin is disconnected from the rest of his supposed team. Nobody even tells him to switch off the field when there’s a new inning. Even though no one’s telling him what to do, he’s now treated like he doesn’t exist. Alone, he does what he always does: retreats into his imagination. He’s roleplaying a Spaceman Spiff fantasy when the batter, against all likelihood, hits a fly ball way out to deep left field. Unfortunately, because he didn’t know the rules, Calvin caught a ball hit by his own team. When the other boys tease him, Mr Lockjaw just lets it happen, even when the other kid threatens to hit him with the bat. Mr. Lockjaw calls Calvin a quitter, even though he’s done nothing to help Calvin feel welcome or stop the other kids’ bullying. I’m a teacher, and we have a saying: “You enter this profession either because you had great teachers or because you had terrible ones.” Assholes like Mr. Lockjaw inspire me, by modeling what I never want to become. The storyline ends with Calvin escaping back into his fantasy world. He and Hobbes play Calvinball, a game that has no rules and no fail state. There are two ways of looking at this ending. One is that Calvin is finally happy again, doing whatever he wants to do with his best friend. The other way of looking at it is darker. If we work from the premise that Hobbes is imaginary, then Calvin has found his solace in talking to a stuffed tiger. And when he plays Calvinball he’s alone, with only an imaginary friend to keep him company. There’s nothing wrong with spending time alone, of course. But there’s something sad about this particular situation, one in which several of the adults in Calvin’s life have failed him on multiple levels. What other options does he have than to be alone, when neither the adults nor the kids give him the support and emotional confidence he needs? As Calvin’s dad says, there is value in sports: learning teamwork, cooperation, and how to win and lose graciously. But Calvin doesn’t learn any of these lessons in this story arc, nor are any of the adults around him equipped to teach him. I have a son who just turned three. I think a lot about my own father and Calvin’s dad as I’m raising him. Calvin is facing these struggles unprepared and on his own. His dad should be with him, encouraging him and teaching him. And I need to be there for my son too. Anything that I want him to know how to do, I have to teach him what to do or find someone who can. My responsibility as a father and a role model is to send him into the world prepared. And if he walks into a situation with neither the skills to accomplish a task nor the courage to ask questions and learn the task, that’s my failure, not his.